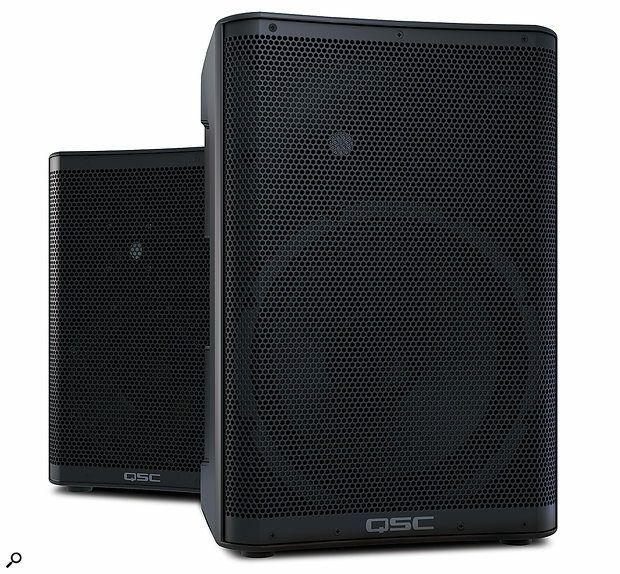 QSC have been major players in the portable powered speaker world for some time, and their systems have gained a reputation for power, performance and build quality. However, their range has, until now, lacked what you might call an entry-level product. The recently released CP Series speakers (the CP meaning 'Compact Powered') have now arrived to firmly plug that particular gap. The philosophy behind the introduction of the CP Series is all about providing a more affordable entry point into the QSC speaker range, but without simply producing a 'cut‑down' version of an existing design. Pricing for the CP speakers is certainly below that of the established K Series, but these designs are new in almost every way; the cabinet size and shape is very different from the K Series and the processing, amplifiers and drivers are also — as far as I can tell — unique to the CP boxes. When any of the big-name manufacturers tag a new product as 'entry-level' my first questions are always, "Does it perform like you'd expect from (insert manufacturer name) at this price?" and "Does it fly the company flag in terms of performance expectations and build quality?" QSC gear isn't known for being inexpensive or indeed entry-level, and so the CP speakers have quite a lot to live up to if they are to assume their intended place as part of a popular and well-regarded live‑sound brand. CP8 £395, CP12 £510. Prices are per speaker, including VAT. CP8 $399, CP12 $499. Prices are per speaker.